The other Hobbs – the last of his line? I never saw Robin Hobbs play – unless right at the end of his career, when he came out of semi-retirement to captain Glamorgan for three seasons, I saw him in a Sunday League game on TV – and that hardly counts. The Essex leg-spinner, who played seven times for England between 1967 and 1971 (including one match when England never took the field) is significant to me for one reason: he was the last English bowler of his type to take a thousand first-class wickets. And it’s hard to see his record being surpassed. Here, then, was England’s Mailey – and to help his cause he was a good fielder and could hit hard – most memorably in his last season for Essex when he took a hundred off the Australians in 44 minutes, taking the prize for the fastest century of the season from a more likely candidate, his team-mate Keith Boyce. But from the selectors there was mistrust. Even after taking 102 wickets at 21 in 1970 he was omitted from the tour party for Australia, where he would surely have done well. After Hobbs’ last appearance it would be a full twenty years before a specialist ‘leggie’ would play for England again, Ian Salisbury rather flattering to deceive with five wickets against Pakistan on his first outing (despite his lamentably unsuccessful Test career, Salisbury took over 800 wickets in first-class cricket and thus has come closer than anyone to emulating Hobbs). Even in the late ‘sixties when he was picked for England, Hobbs was something of a lone torch-bearer. 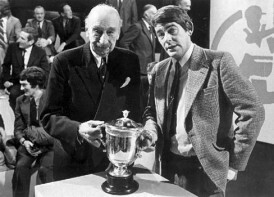 The last time that England had had several wrist-spinners to call on had been twenty years earlier: in 1948 it was Eric Hollies of Warwickshire who ended The Don’s final innings with a googly that the great man somehow failed to pick, and among others plying the same trade, and attracting the attention of the selectors, were Roly Jenkins, Doug Wright, Jim Sims and Peter Smith, as well as a couple of leg-spinning all-rounders in Walter Robins and Freddie Brown. But, tellingly, none of these was exactly in the first flush of youth. A decade later, the position had changed noticeably. England’s strength lay with the fast men, backed up by Jim Laker and his off-spinning successors. The leg-spin hopes rested on Lancashire’s Tommy Greenhough – troubled by injuries and technical issues, limited to just four Tests – while, in a foretaste of the future, the leading exponents of wrist-spin in the ‘fifties were from overseas: notably Bruce Dooland and Gamini Goonesena, as well as ‘chinaman’ purveyors George Tribe and Jack Walsh. During the following decade leg-spin became more and more the preserve of batsmen who could bowl. For England this generally meant Bob Barber and Ken Barrington, and rather less frequently Colin Cowdrey (like Nasser Hussain, another Indian-born captain of England, a useful bowler as a schoolboy) and Keith Fletcher. Barrington later became a regular net bowler on England tours, on which he combined the roles of assistant manager and coach. He was needed, certainly – when England lost six wickets to Abdul Qadir, playing in only his second Test, at Hyderabad in 1977 it’s likely that many of the side had not faced a bowler of his type before. A little later Kim Barnett showed some promise with the ball before the twin demands of captaining Derbyshire and opening the batting consigned his bowling to little more than a hobby. In the 1970s there was Harry Latchman at Nottinghamshire and Warwickshire’s Warwick Tidy, a precocious talent but out of the game by the age of 21. His form had fallen away but also, probably, his confidence given that the county already had Lance Gibbs and Eddie Hemmings. Among the reasons usually given for the postwar decline in wrist-spin bowling in England are the introduction of limited-overs cricket and the practice of full covering of wickets. There is probably some truth in both, as well as a change in the lbw law that allowed the batsman to be out to a ball that hit outside the line of off stump, if not playing a shot. This was clearly of more benefit to the off-spinner than the leg-break bowler. With even Championship innings limited to 100 overs for a few years, the finger-spinner firing the ball in at off stump was clearly going to be of more use in keeping the runs down. It might be imagined that a visiting world-class spinner, like Shane Warne (who also played county cricket of course) would be an inspiration to youngsters to take up this most difficult of skills. But it doesn’t seem to have happened. For one thing, Warne hasn’t been seen here on terrestrial TV since 2005; and besides, there still exists an outdated fear of the uncertainty, which in some quarters can translate to a reluctance, to offer the ball to a leg-spinner,or an equally indecent haste with which to wrestle it from his grasp following a first-over loosener that hops to the mid-wicket ropes (it’s also my own experience, playing in adult cricket in generally low-scoring games, that the slow bowler is cut rather less slack when his first over proves expensive). Pitches have a bearing on matters too. Why do Australians take to leg-spin like ducks to water? Surely it’s because they have hard, bouncy tracks and the sort of weather that we in England might expect to see for about ten days a year. A country of slow, low pitches and damp, cloudy conditions is hardly an encouraging environment for any young spinner, even one who’s lucky enough to go to a school where cricket is played. The prognosis is not encouraging. Perhaps one decent summer would help, but primarily we need one young player to achieve success with England. Adil Rashid has his supporters but a Test debut seems some way off. Without an England appearance for more than three years, his career seems to have stalled. A thousand wickets is hard for any bowler to achieve now – in the last decade only Martin Bicknell, Andy Caddick and Robert Croft among English bowlers have managed it – so it looks very much as if Robin Hobbs, who turned 70 last year, really will be the last of his line. Since (as you say) Rashid hasn’t played for England since 2009, I’m surprised you didn’t mention Scott Borthwick, who played a few times in 2011 and is in the current Lions squad. Yes good point, and Chris Schofield should have had a mention as well. I wonder how close Borthwick is to the full side though, I suspect he may have to wait a while for his next appearance.